One size fits most women. 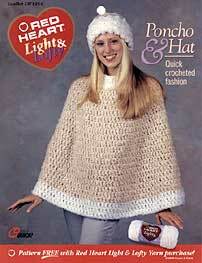 Poncho measures 23½" long from shoulder to hem and 63" around at lower edge. Hat circumference is 21". RED HEART® Bulky Weight Yarn. These models made in RED HEART® "Light & Lofty™", 100% acrylic, Art. E708 (6 ounce skeins). Amount-Poncho: 18 Ounces No. 9334 Café Au Lait CA and 5 ounces No. 9316 Puff CB. Hat: 2 Ounces CA and 3 ounces CB. Crochet Hooks: U.S. Sizes N-15 [10mm] and P-16 [11½mm]. GAUGE: In dc - 5 sts = 3"; 4 rnds = 4" with smaller hook. In sc  5 sts = 3"; 8 rnds = 4" with smaller hook. CHECK YOUR GAUGE. Use any size hook to obtain the gauge given. With smaller hook and CA, ch 40; join with a sl st to form a ring, being careful not to twist ch. Rnd 1: Ch 1, 2 sc in first ch, sc in next 7 ch, * 2 sc in next ch, sc in next 7 ch; rep from * around; join with a sl st to first sc  45 sc. Rnd 2: Ch 3, dc in same sc as joining, dc in next 2 sc, * 2 dc in next sc, dc in next 2 sc; rep from * around; join with a sl st to top of ch-3  60 sts. Rnds 3 and 4: Ch 3, dc in each dc around; join to top of ch-3. Rnd 5: Ch 3, dc in same ch as joining, dc in next 3 dc, * 2 dc in next dc, dc in next 3 dc; rep from * around; join  75 sts. Rnds 6 and 7: Rep Rnd 3. Rnd 8: Ch 3, dc in same ch as joining, dc in next 4 dc, * 2 dc in next dc, dc in next 4 dc; rep from * around; join  90 sts. Rnds 9 and 10: Rep Rnd 3. Rnd 11: Ch 3, dc in same ch as joining, dc in next 5 dc, * 2 dc in next dc, dc in next 5 dc; rep from * around; join  105 sts. Rnds 12-21: Rep Rnd 3, changing to CB in last dc of Rnd 21. Cut CA. Rnds 22-24: With CB rep Rnd 3. Fasten off. Neckband-Rnd 1: With right side facing, smaller hook, and working on opposite side of beg ch, join CB in any lp, ch 1, sc in each lp around; join with a sl st to first sc  40 sc. Rnds 2-5: Ch 1, sc in each sc around; join. Fasten off at end of Rnd 5. Weave in ends. Brim: With larger hook and CB, ch 34; join with a sl st to form a ring, being careful not to twist ch. Rnd 1: Ch 1, sc in first ch, dc in next ch, * sc in next ch, dc in next ch; rep from * around; join with a sl st to first sc; turn  34 sts. Rnd 2: Ch 1, sc in first dc, dc in next sc, * sc in next dc, dc in next sc; rep from * around noting that last dc is worked into same sc as joining of previous rnd; turn. Rep Rnd 2 until 7" from beg, changing to CA in last st of last rnd, do not turn. Crown: Next Rnd (Right Side): Change to smaller hook, ch 1, sc in each st around inc 1 st; do not join but mark end of rnd by placing a contrasting thread between the last and first sts  35 sc. Do not turn. Work even in rnds of sc for 3½". Shape Top: [Draw up a lp in next 2 sc, yo and draw through all 3 lps on hook  dec made; sc in next 3 sc] 7 times  28 sc. Next Rnd: [Dec, sc in next 2 sc] 7 times  21 sc. Next Rnd: [Dec, sc in next sc] 7 times  14 sc. Next Rnd: [Dec] 7 times  7 sc; sl st in next sc. Fasten off. Weave yarn through remaining sts, draw up tightly and fasten securely. Fold brim in half to the right side. ABBREVIATIONS: beg = begin(ning); ch = chain; dc = double crochet; dec = decrease; lp(s) = loop(s); mm = millimeters; rep = repeat; rnd = round; sc = single crochet; sl st = slip stitch; st(s) = stitch(es); * = repeat whatever follows the * as indicated.